Outdoor Living Spaces for the Carolina Coast. A backyard is most times the last area of a home to get consideration. When you move into a new house you of course have to take care of your indoor living spaces first. Your living areas such as kitchens, bedrooms, bathrooms etc. need to take precedence. But eventually spring comes around and the weather gets warmer and you have that itch to get outside. All of a sudden you look out back and realize you have a whole new area of your home that you can do with as you please. A very large and valuable part of your home! • The average cost to improve the inside of your house is between $75-$150 per sq. ft.
• The average cost to improve the outside of your house is between $15-$75 per sq. ft.
• Outdoor improvements are not taxable, adding rooms to your house are taxable. Many homeowners don’t know where to start. You may have an idea of what you want to do or what you want to see when you walk out your backdoor but you’re not quite sure how to get there. A comprehensive design should be your first step to insure you know what your backyard will look like before any work is started. These are just a few ideas of what you can do with outdoor living spaces in your backyard. Tiki bars, firepits, koi ponds, waterfalls, retaining walls, walkways, pergolas and gazebos. Batting cages, bocce ball courts, sandboxes, etc. The list goes on and on. What we’ll do is come take a look at your space and talk with you about what you would like your yard to become. We’ll create a plan that can be completed all at once or in stages. 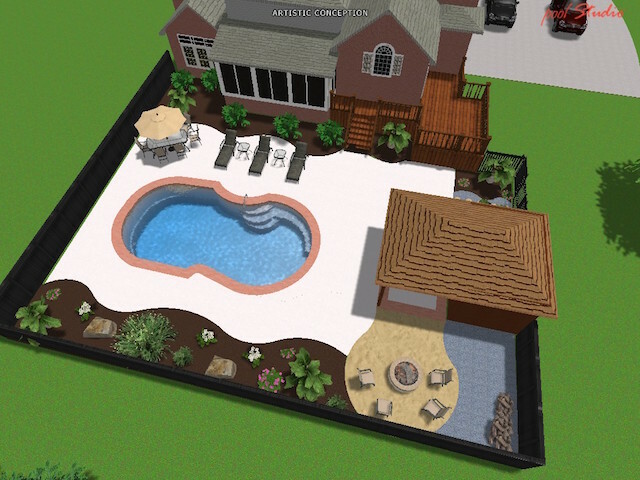 Prepare and present to you a “to scale” 3-D Design of your new backyard like the one you see above. Give you an estimate and timeline for your project. Making use of the outdoor living space in your home so that you can enjoy the beautiful Coastal Carolina weather will be one of the best choices you could make! It’s your backyard…Use it. Live it. Love it! What Is The Best Time Of Year To Install A Pool? The answer is Winter and Fall. The end of summer and into the Fall months are easily the best time of year to install a swimming pool. The reasons are pretty simple. For one the weather starts to cool off making for better working conditions for the installers. A second reason is a “stress free installation”. The swim season is over so there is no pressure of “upcoming party” time lines that need to be met and the kids aren’t asking every day “can we swim yet?” Also if an unforeseen delay pops up it can be handled in a timely and stress free manner. Another reason is that fall is a great time to plant. Pool installations wreak havoc on a backyard so installing in the Fall gives you plenty of time to get your yard back in shape in plenty of time before Spring and swim season. A fourth reason is that some pool manufacturers and installers give Fall & Winter discounts which offers the homeowner a chance to save a few bucks. One last reason is that most pool manufacturers raise prices at the beginning of the new year and this gives the homeowner another way to save some money. Granted the one drawback is that you won’t get to use the pool right away but if you can get past that one fact the Fall is clearly the best time to have a swimming pool installed in your backyard. The Backyard Fire Pit & The Oyster Roast. A Perfect Match! Outdoor Kitchens: Custom vs Prefab & What Do They Cost? 5 Reasons Why You Should Install A Pool While Building Your House.